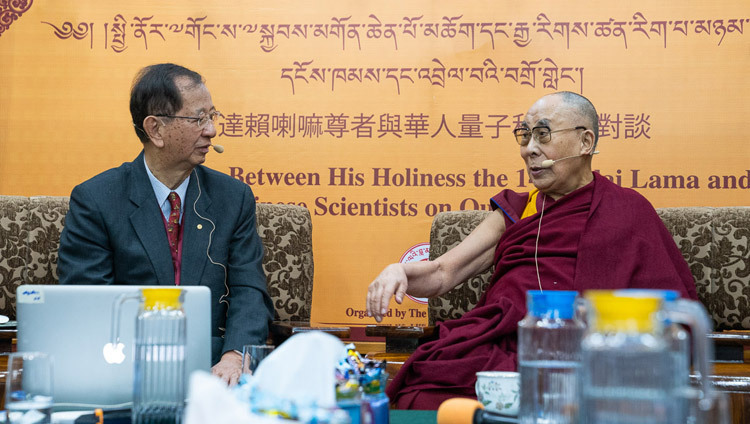 Prof Yuan Tseh Lee opened the third day of discussions between Chinese scientists from Taiwan and the USA and His Holiness the Dalai Lama by expressing the presenters’ great appreciation of the opportunity. He then spoke extensively about Challenges and Opportunities for a Sustainable Planet. After drawing attention to the tremendous source of energy the sun represents for the earth, he showed a photograph of our planet from space. He reported a philosopher’s observation that seeing the world like that, free of boundaries, would inspire people to work together to protect it—has it happened yet, he asked. Prof Lee outlined the emergence of human beings two million years ago and their beginning to engage in agriculture 10,000 years ago. This led to settlements and the building of larger structures in which to live. His Holiness asked about the migration of human beings out of Africa. Prof Lee dated it as having taken place 50,000 years ago. It was the industrial revolution that brought significant change. Up until then most energy was derived from the sun, but with the industrial revolution people began to dig for coal, which enabled them to make steel, cement and so forth. Soon most energy was derived from fossil fuels like coal, oil and natural gas. Energy consumption hugely increased and the population also grew. At the start of the 20th century the global population was 1.5 billion, by the end it was 6 billion and now it is more than 7 billion. As the population grew, so did pollution, which now fills the air of our cities. Burning fuel for energy has increased emission of greenhouse gases. The result is that while energy from the sun continues enter the atmosphere, the heat that used to escape can no longer do so. 1. aim to limit average global temperature increase to 2°C or better 1.5°C. The Professor wryly observed that even after terrible disasters people regard them as freak events rather than something likely to happen again. He mentioned a book written by a Japanese scientist in 2000 that predicted that on the present course humanity would disappear within 80 years. People refused to take him seriously. The Intergovernmental Panel on Climate Change (IPCC) has recommended that major changes have to be made. Climate change must be recognised as a global problem that requires a global solution, with a target of zero carbon emissions by 2050. Socially there needs to be a turning away from over development. Prof Lee recalled that at the Rio Summit in 1992 the Prime Minister of Norway suggested that sustainable development is what satisfies the present generation without compromising the needs of the next generation. Technologically there needs to be a complete shift away from fossil fuels to cheaper alternative means of generating energy. e) improve equality around the world—which at least means closing the gap between rich and poor. “Wonderful,” His Holiness responded, “global warming is really serious and is giving rise to more and more natural disasters. Since everything is interdependent, we have to reassess our lifestyles and adopt alternative energy sources. Big companies and big nations have to take responsibility. The USA’s withdrawal from the Paris accord is very sad. In these circumstances it is important for scientists to speak up about the dangers we face and alert the public. I agree that the gap between rich and poor is also very serious and that we have to take steps to close it by helping the poor. “Over the last two days our discussions have focused on external phenomena, but real change in the world will only come from a change of heart. Self-centredness is harmful; we must think instead in global terms. We can change people’s ways of thinking through education and scientists can contribute to this by providing detailed information. Ultimately we have to change attitudes, not by law but by education, because the problems that have just been described concern the whole world. After a short break for tea, Dr Thupten Jinpa took over as moderator. Before opening discussions to the floor he took the opportunity to introduce two guests—Susan Bauer-Wu, President of the Mind & Life Institute in the USA and Amy Varela, Chairperson of the Mind & Life Institute in Europe, commending them for the good work they have done. Prof Maw-Kuen Wu asked His Holiness to clarify how things evolve from space. “When we talk about empty space,” he replied, “we have to get a clear perspective on the context. There’s a lot of space here in this room, for example. There are also many particles here. At an atomic level, each atom occupies space. How empty space fulfils its role is complicated. Particles have space to move around and they can even bump into each other. In the quantum physics presentations we’ve heard, we’ve focused on the physical world. Now we also have to focus on the inner world, paying more attention to mental consciousness. “Many brain specialists still do not accept the idea of mind that is not just a function of the brain. However, I know meditators who can remain concentrated for an hour or more. An American I know can maintain his concentration for up to three hours and during that time deeper experiences arise. I mentioned Richie Davidson who is looking into the subtle consciousness that manifests after death. “Then there are people who remember past lives. I recently heard of a child who remembers dying during the September 11th attack. When I was young, my mother told me, I had clear memories of my past life. However, it seems such memories persist while the new brain is still fresh but fade later on. There was a boy born in Tibet who was eventually recognised as the reincarnation of Geshe Thupten Tsering of Ganden Monastery. He told his parents he should return to Ganden, but when they went to that Monastery in Tibet, he said, “No, the one in India.” They made their way there and as they approached he was able to indicate the house where the Geshe had lived. When they went inside he pointed to a drawer saying my glasses are in there, which they were. Dr Yueh-Nan Chen asked His Holiness if his understanding of quantum physics helps his meditation. He also wanted to know whether this dialogue had met his expectations and what he hoped for it in the future. “My daily practice is to meditate on emptiness,” His Holiness told him.” and altruism as well. Je Tsongkhapa talks about developing meditation on emptiness. He says, appearances are infallible dependent arisings; while emptiness is free of assertions. As long as these two understandings are seen as separate, you have not yet realized the intent of the Buddha. When these two realizations are simultaneous and concurrent, from a mere sight of infallible dependent arising comes certain knowledge which completely destroys all modes of mental grasping. At that time the analysis of the profound view is complete. “After such experience there is no basis left for objectification. Worldly appearances serve to remind you that things are empty. This undermines the basis for grasping at intrinsic existence and false projections. Quantum thinking can really help with this. “One way of defeating self-centredness is to pursue emptiness, which you can base on your understanding of quantum physics, but when you join that with an altruistic aspiration based on exchanging self with others, it becomes a powerful combination. Prof Yuan Tseh Lee asked if the potential end of humanity concerned him and His Holiness replied that there are countless other world systems and, come to that, countless other sentient beings. Nevertheless, he said, we will be better able to deal with problems we face if we cultivate a sense of the oneness of humanity, regarding other human beings as our brothers and sisters. Describing the last three days as wonderful, Prof Yuan Tseh Lee declared they had learned a lot. His Holiness responded, “I hope this just the beginning. I hope such meetings can be repeated.” He offered each of the presenters a kata, a white silk scarf, and invited them and their companions to join him for lunch.